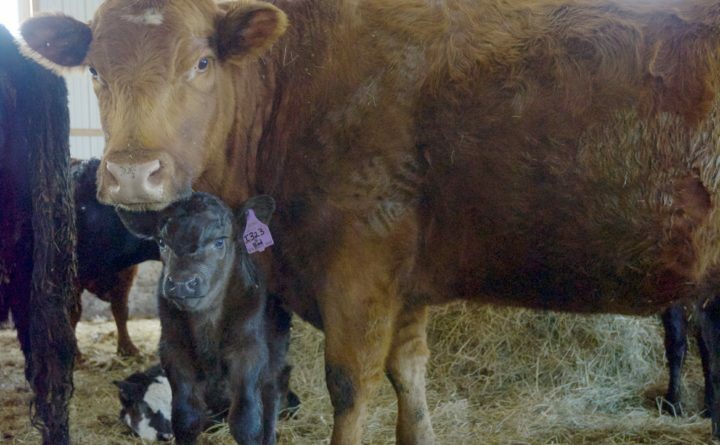 Good mothering is essential for raising healthy beef calves. Ideally, the farmers are simply observers in the birth and bonding process. Beef farmer Erin Parisien spends a few moments with one of her expectant mothers at Aroostook Beef Co. in New Canada. There is nothing quite like a sunny pile of fresh hay for newborn calves. 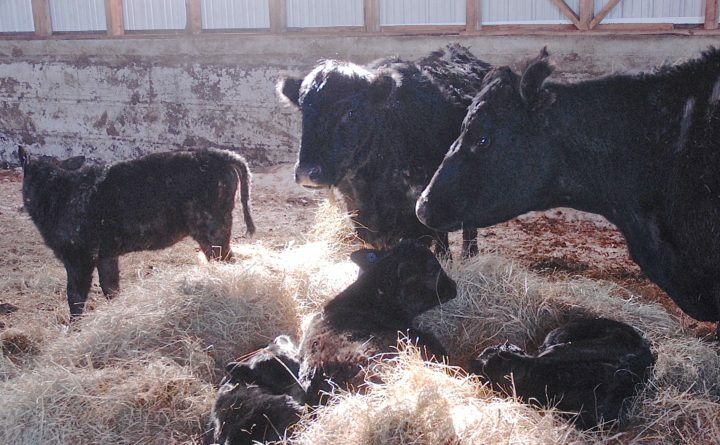 Cows and newborn calves relax in a sunny spot in the Aroostook Beef Co barn in New Canada. Owners Erin Parisien and Richard Nielsen anticipate welcoming around 140 calves over the next couple of weeks. 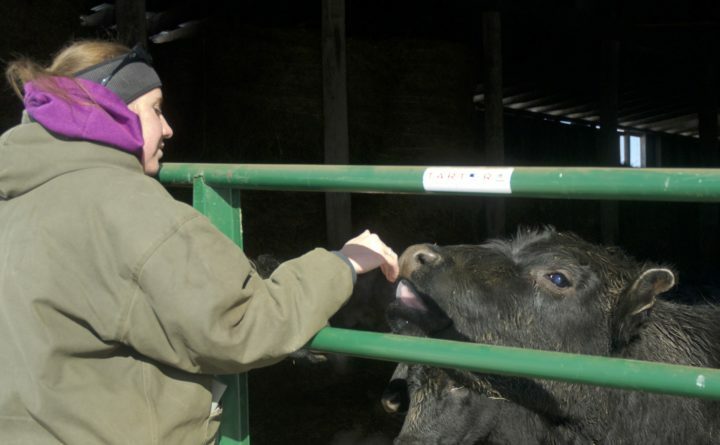 These days, Erin Parisien is never sure what to expect when she arrives at her beef cattle barns off Route 161 just south of Fort Kent. All she knows for sure is there will likely be several new additions to the herd. Though not the numbers that are seen in the big beef states like Texas, Montanna or Nebraska, Maine’s own beef numbers are respectable, according to the state’s livestock expert. And while people tend to equate calving with spring, Kilgore, who raises beef cattle, said the due dates are really up to the farmers. She, for example, plans her breedings so the calves are due in the fall. 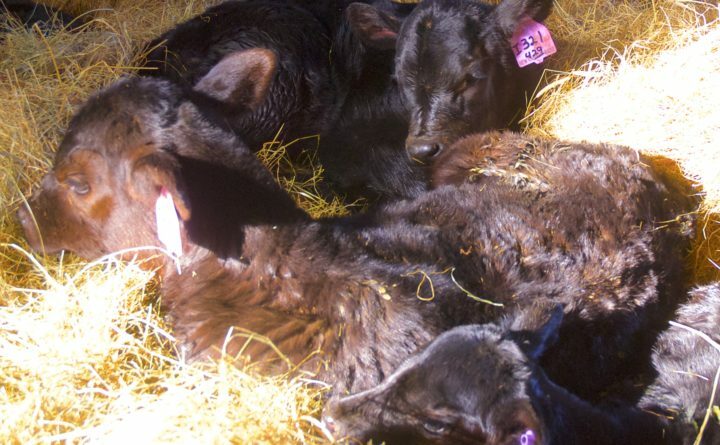 So far, Parisien and her husband Richard Nielsen have welcomed 40 black Angus calves over the last couple of weeks from cows or heifers bred to one of their six bulls last May and June. By the time calving winds up next month, there should be 100 more. Once the calf is born, she said, the mother should begin taking care of it immediately. Parisien and Nielsen carefully monitor their pregnant cows and heifers, but unless there is a medical reason to get involved they are strictly hands off when it comes to delivering newborns. A “heifer,” according to Parisien, is defined as a female cow which has never calved. As first-time moms, these animals may need a bit of barnyard midwifery if their maternal instincts don’t kick in right away. Bottle feeding a newborn is all fluffy cuteness for about an hour, Parisien said with a laugh. Then there are the calves who are a bit too ambitious when it comes to getting a meal. Looking over the “nursery” barn full of cows and calves, Parisien points to an adult heifer that had crowded up to a cow and was showing great interest in the older animal’s milk-laden teets. For the most part, she said, the cows, heifers and calves enjoy a calm and peaceful coexistence spread out between two barns and a snow-covered pasture. The pregnant animals and calves were all housed in a single structure up until last week when things got a bit crowded with all the newborns, so the moms and calves were moved several hundred feet down a dirt road to a the nursery barn. Meanwhile, the pregnant cows and heifers stayed behind and on any given day welcome two or three newborns. “The calves always seem to come just before Richard shows up in the morning to check them,” Parisien said. And while a majority of those calves arrive on their own with no help from Parisien or Nielsen, once they do arrive, there is work to be done. Weighing in at around 80 pounds at birth, each calf is welcomed into the world with a shot containing minerals including selenium and copper and vitamins. Each calf’s umbilical stump — the “belly button” — is treated with an iodine solution to promote healing and prevent infection and the males are castrated. Finally, a tag is attached to each newborn’s ear with coded information indicating it’s breed and age. On a recent sunny March day, calves were scattered around the nursery barn, some actively nursing, some exploring and others curled up snoozing on a sunny pile of hay with their moms keeping a close eye on them nearby. Kilgore said weight gain can also make a formidable protective mom.